A black cat apparently crossed the wrong path Tuesday afternoon – and ended up as lunch for a bald eagle. 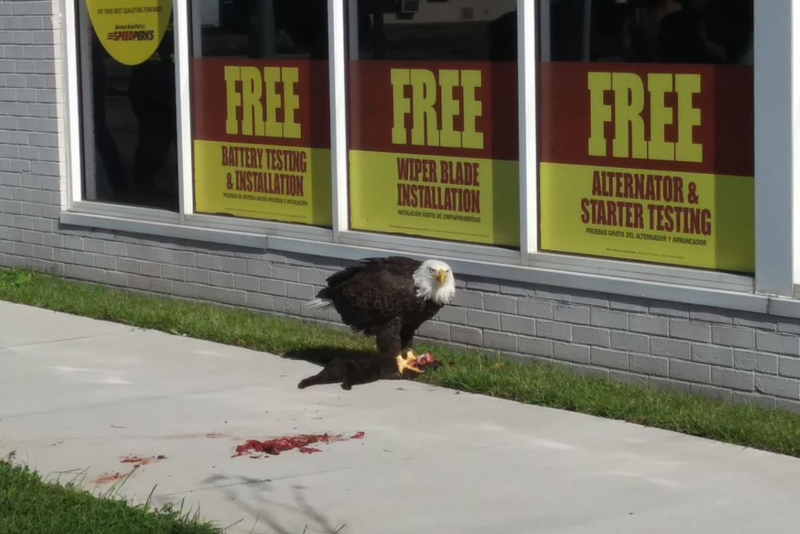 Dozens of people crowded around as the eagle ate the cat on the sidewalk. Traffic stopped in front of Advance Auto Parts at 26th Street and Monticello Avenue as drivers took a closer look, said store manager Bobby Rafalski. The eagle was more than two feet long from head to tail and stood around a foot and a half tall, he said. People were eager to get photos, but they weren’t getting too close. The eagle’s meal, Rafalski said, looked like a fully grown black cat. The eagle nearly picked it clean over the course of about 45 minutes, he said. Employee Carol Sills said there were many birds hanging out on the power lines and street lights as usual, and then suddenly they all took off when the eagle showed up. But once the eagle had landed, people with camera phones flocked. Matt Seniuk, a physics teacher at Norview High School, saw the crowd on Monticello on his way to coach football at Blair Middle. He thought there may have been a fight or an accident, then glimpsed the big bird. “It was surreal. You’re right in the middle of downtown, almost,” Seniuk said. Stranger still: the bird seemed unperturbed by the onlookers. Seniuk said he’d seen eagles in zoos and while rafting on the Delaware River in his native Pennsylvania. “In the woods you see things, but I’ve never seen anything like that,” he said. He sent his nature-loving mother graphic photos and video of the eagle’s feast. And in nature there’s always a predator and prey. Rafalski said the first call to his store Wednesday morning was a weeping woman looking for her missing black cat.